Those were the words of Dominican Sister Pauline Quinn, OP, in a special October 2 presentation to the Adrian Dominican Sisters at the Dominican Life Center. Those words described the message that she hopes prison inmates throughout the United States receive as they learn to train dogs to be of service to people with disabilities. Sister Pauline could apply those same words to her own life experience: just like the prison inmates and the people with disabilities, Sister Pauline suffered much abuse and hardship as a child, but her life was turned around by a German shepherd named Joni. 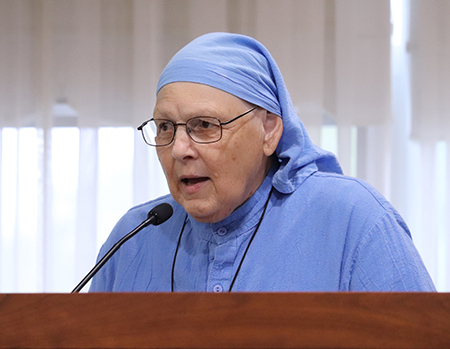 Sister Pauline – who made private vows as a Dominican Sister and who is not formally a member of a Dominican Congregation – now makes her home at the Dominican Life Center with retired Adrian Dominican Sisters. Accompanied by her own service dog, Pax, she shared her life story with the Sisters and expressed her gratitude for their kindness and hospitality. Her early years were filled with abuse and rejection. She had lived in 14 different institutions and in many ways was misunderstood and treated harshly. Even after leaving the institutions and living as a homeless woman in Los Angeles, Sister Pauline struggled, but she began to see the need to focus on taking care of herself and ignoring what others thought of her. Since 1981, this new life has involved Sister Pauline’s ministry of initiating dog-training programs in prisons. She established the first program, the Prison Pet Partnership, at a women’s prison in Washington State. Similar programs have since been established at prisons throughout the United States, Canada, and Europe. She continued in her ministry of initiating prison dog programs through Bridges and Pathways of Courage, a non-profit organization established in 1985. Other programs under Bridges and Pathways focus on providing hope for children through education, medical services, and improved living environments; helping people who are disenfranchised by offering them opportunities; and supporting and caring for people suffering from trauma. Sister Pauline continues to reach out to people throughout the world who are in need of help. She told the Sisters of her help for Emmanuel, a young man from Uganda who needed assistance in opening a preparatory school in his home town. “It seemed like an impossible task to build a school in that remote area,” she said. “God took care of many birds of the air, so I knew God could help me to help Emmanuel.” She has raised money to open the school for 138 children and to build a dormitory to protect the girls. “That, too, was built” with the help of many donors, she said. In November 2018, Sister Pauline will visit Hong Kong to help establish a service dog program. “They only use guide dogs for the blind,” she said. “This will be to open the doors” to the use of other service dogs in Hong Kong.